In a just world, one in which fame was proportionate to talent, Davóne Tines would be as big as Kanye. 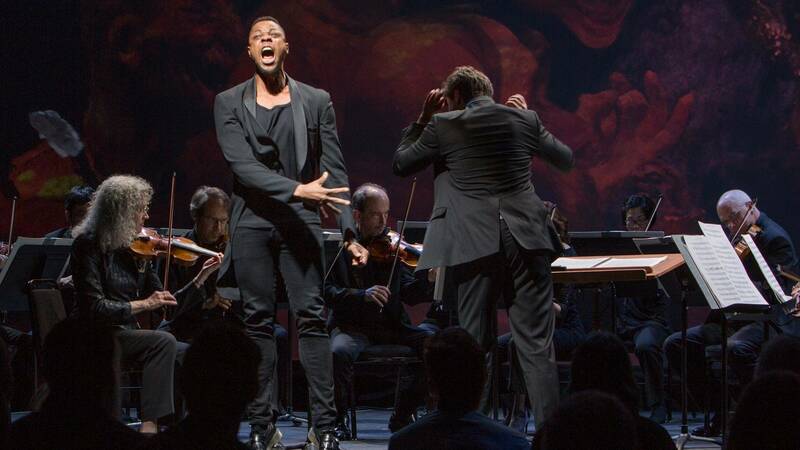 In the world we live in -- the one where live classical music and its patrons exist in a different orbit entirely from that of rock, pop, hip-hop and even jazz -- he's an alarmingly charismatic bass-baritone, a bright young star of the opera scene, one whose delivery draws clearly from the soulful church music on which he was raised. I didn't know his name before last night. 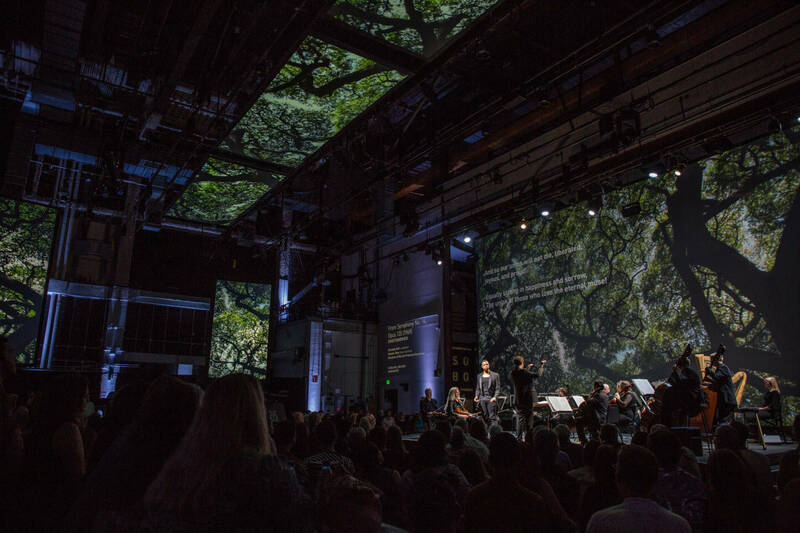 And if the San Francisco Symphony hadn't created Soundbox, a two-year-old experiment that blends the atmosphere of a nightclub with classical performance and visual art installations for a show curated around a different theme every month, performed over one weekend in a small, warehouse-like room abutting Davies Symphony Hall, I might never have known it. Which also means I wouldn't have experienced the moment Friday night, March 17, when Tines traced a slow lap through the audience, scanning the room as he reached deep into the bottom of his impressive register and emerged with such a powerful performance of Caroline Shaw's "I'll Fly Away" that the hair on my arms stood on end for a full five minutes. This man sings the way Olympic gymnasts tumble -- How is that body doing that? Why do I want to laugh and also cry? He sings like there are stakes to every syllable. "Captivating" doesn't begin to describe it. That moment was just one of at least a dozen at Soundbox that exceeded any expectations I had for the evening. I am, to be sure, the audience member for whom Soundbox was created: young, city-dwelling, supportive of the arts in theory but in practice, perpetually broke and, relatedly, not prone to buying symphony tickets. Whether or not Soundbox has been a success in this capacity -- as a "gateway" classical music drug of sorts, to eventually get young people hooked on the seated, cocktail-less performances in the building next door -- will be determined over time. But the show's popularity speaks for itself: performances tend to sell out about 20 minutes after tickets go on sale. Lining up at the entrance earlier that night, we'd overheard two under-21 attendees trying to figure out how to sneak in. 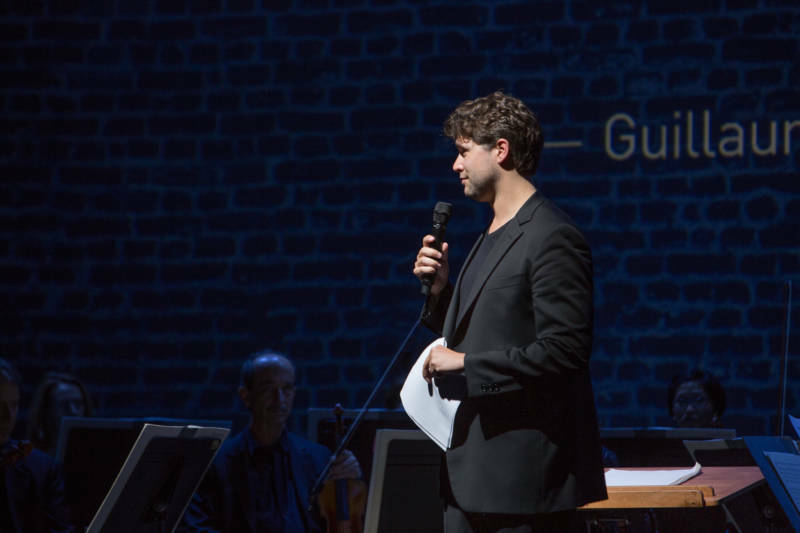 The theme for this evening was Rebel, and the programming, curated by SFS Resident Conductor Christian Reif, was divided into three geographic regions: broadly, composers from Germany, Russia and the U.S. whose work responded to oppression or censorship. Over the course of 90 minutes, with audience members lounging on couches or at bar tables, many of them wearing jeans and sneakers, nearly everyone sipping a cocktail or beer, music and video projections transformed the room into the Weimar Republic, then into Soviet Russia, and then again into contemporary America. Three different short stages -- one of them square in the middle of the crowd -- kept redirecting our attention around the room as groups of SFS players as small as two or as big as 20 performed, essentially, in our faces. It was intimate to say the least. In some cases (like when violinist Dan Carlson's performance of the final movement of Hartmann's Concerto funebre left me half-expecting to see smoke rising from his instrument) the closeness was exhilarating. Transported to Russia, we were soon in the hands of Shostakovich, a composer who lived something of a double life: forced to compose songs that served as propaganda for the Soviet government, he also quietly produced caustic work that's now read as satire. 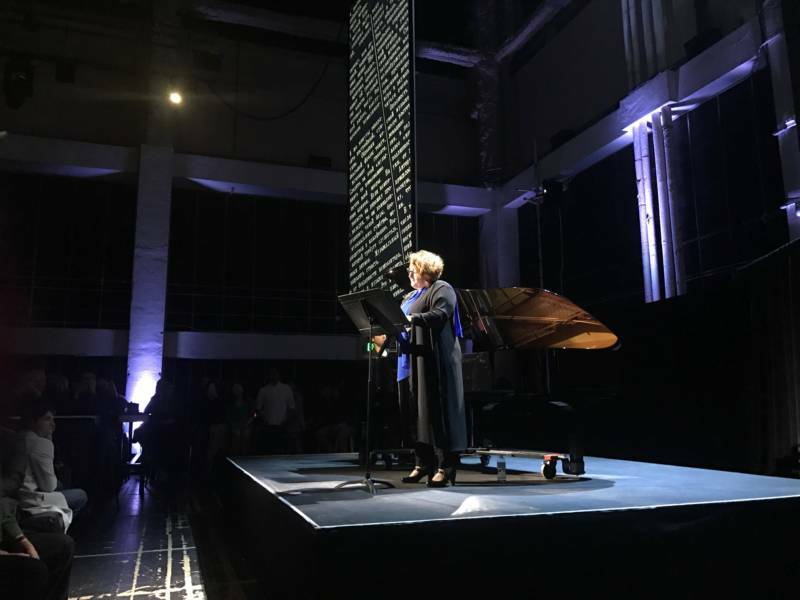 Soprano Catherine Cook sang while Rief accompanied her at the piano for Satiri, a piece full of bitter humor that Shostokovich apparently wrote as he was anticipating forced membership into the Communist Party. "Artists have been feared by tyrants, because they speak the truth," said Reif during a brief break between music. "You can get rid of people, but you can't get rid of art." 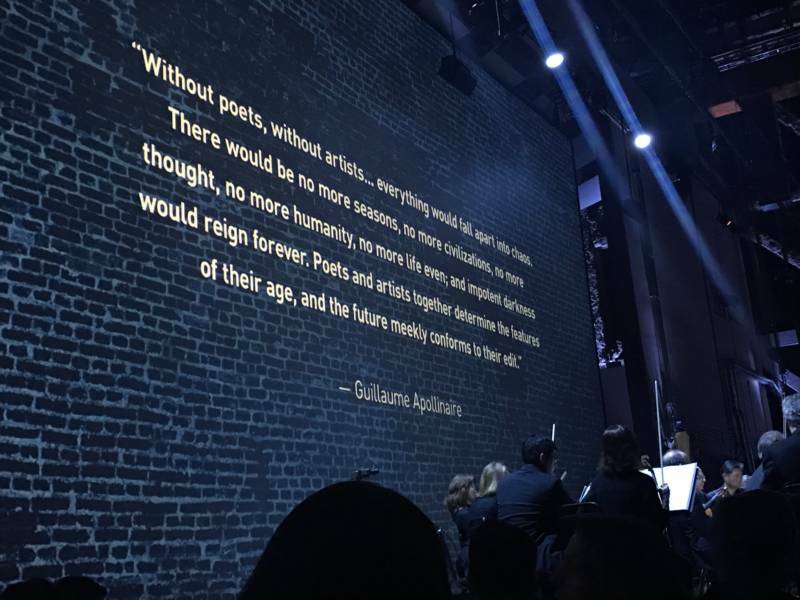 Perhaps unsurprisingly, the most poignant notes of the evening arrived in its final third: when we, as an audience sipping $13 cocktails on a Friday night, were asked to consider the United States' own history of discrimination, oppression and abuse. 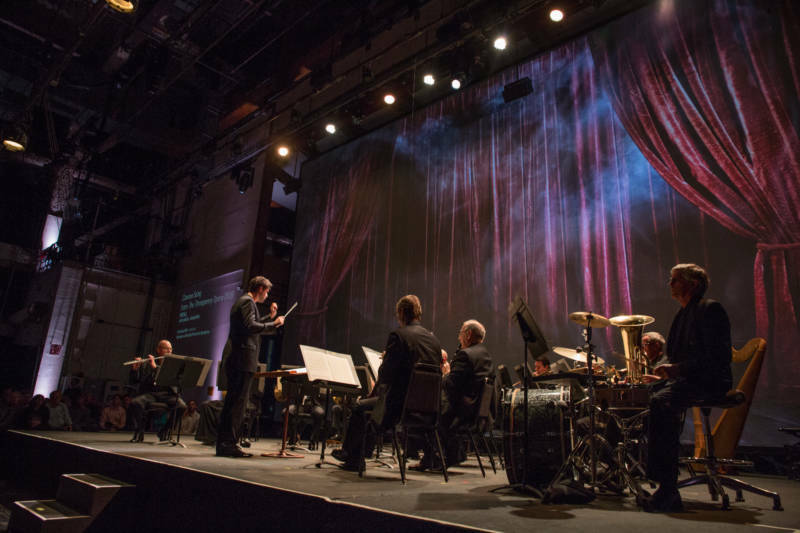 If Tines stole the show on that spiritual, the two other pieces were close behind: Selections from Black Angels, the avant-garde composer George Crumb's response to the Vietnam War, conjured demons even without the dark video projections. And the excerpt from Julius Eastman's emotional, minimalist Gay Guerilla -- which SFS Associate Director of Artistic Planning Richard Londsdorf casually told me after the show had required some interesting translations, it had never been performed with a symphony before -- was rendered all the more moving by an introduction in which Reif explained that Eastman, a gay black composer, had died alone and homeless, his work receiving most of its acclaim after his death. By the time the video screens projected images of the American flag around us during Jessie Montgomery's Banner, it was impossible to see it not as a sign of pride or patriotism but as a question, a reminder of the crossroads at which we currently find ourselves as Americans. Given the examples we'd just borne witness to -- the weight of history, the potential outcomes from fascist regimes -- where do we go from here? What kind of country do we want to be? When the protest songs of 2017 are performed 100 years from now, will they be tinged, as songs from Nazi Germany are, with futility? 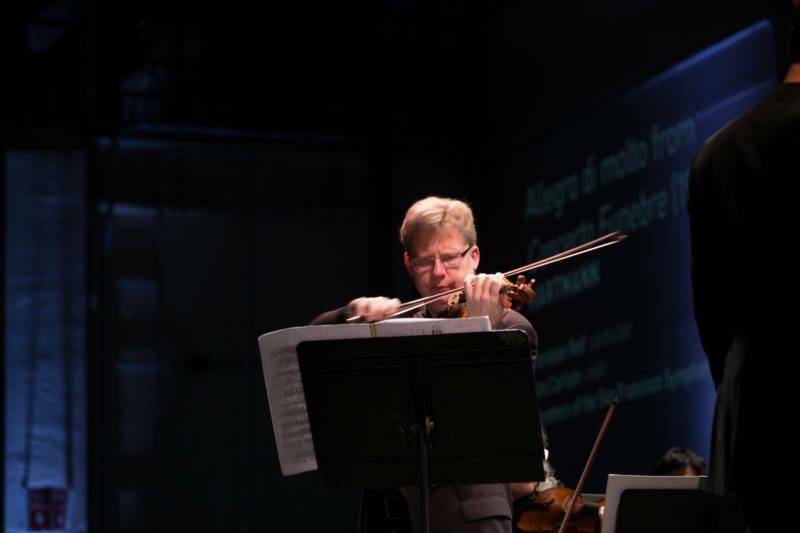 "Obviously the theme is timely," the German-born Reif told me a few minutes after the show's conclusion, as he and several performers, including Tines, mingled with audience members. "But I think artists have always had ways of speaking the truth about what's happening around them, maybe ways [other people] can't." Finding examples of this throughout history, he said, wasn't difficult. People were beginning to trickle out then, and a playlist of classic anti-war songs (Creedence Clearwater Revival at the symphony, anyone?) was briefly interrupted by a police siren from the street outside. Outside, it was St. Patrick's Day in 2017 in America, and the bars downtown were filled to the brim with Irish whiskey-swilling humans, many of them likely doing their best to forget the present. It's an understandable desire. But I also left Soundbox with an oddly calm sense of power, of context: a feeling in my bones that these waters aren't uncharted. It is both terrifying and reassuring that the human race has been here before. And at every point in history, from pretty much every corner of the globe, artists have left behind important lessons for us, not-so-secret gems of notes for this very purpose -- songs as messages in bottles, if you will. We just have to decide, really, to listen. The next Soundbox takes place April 14 and 15, curated by SFS trombonist Tim Higgins. Tickets ($45) go on sale Monday, March 20 at 10am; more info here.